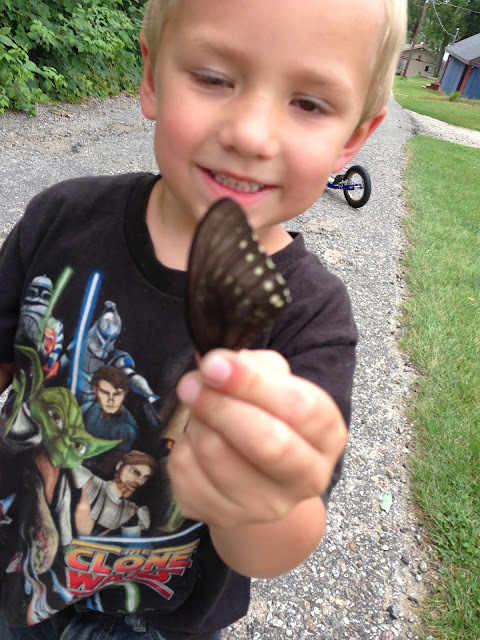 My son found a butterfly wing the other day. He was so excited! Do your children (or you!) ever find natural treasures? What do you do with them? Feathers--Lots of feathers. This guy is always super excited to find a feather. Nests--Earlier this week we even found a dead baby and broken egg nearby. We observed and let them be. Dead birds--Yes, I was surprised, too. I thought only cats and dogs brought presents back to their owners. 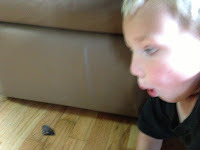 My sons found a blue jay fledgling at soccer practice last week and brought their "treasure" back to mom. What a proud mom, hinting with sarcasm. We had a talk about not carrying dead birds around and sanitized hands. Rocks--Found a perfectly split one not too long ago at a business. It's been sitting on my driver's seat for a couple of weeks. It's like a puzzle putting it back together. Note to self: Put treasure in our treasure area or with our rock collection. Acorns and Nuts--Acorn tops are especially fun. Santa's Pantry is looking for some. Good for hats on finger puppets! Black walnuts are fun to find in the water (per my 8-year-old). Moss--Yes, my kids bring me sections of moss they like. Tadpoles--We just looked at them for a little and put them back in the water. Frogs and Toads--These have been easy to catch recently in places we have been. They're fun to look at. Don't wear bug spray while handling. Put them back where they were found. Sticks--I have 4 boys. Let's just say there are lots of sticks around here. On the trail with any size group, I limit the size of the stick so it's manageable and won't whack someone in the head if they turn around quickly. At the same time, the challenge of dragging a LARGE stick can be fun! Seeds--These are everywhere, from the samara (maple "helicopters") to hitchhikers on socks. These can be great for gathering and using as "loose parts". Dead insects or insect "shells"--These casings or dead insects are neat to observe. It's hard to see them up close when they're alive when moving all over the place. Shells--Hopefully they're no longer alive if keeping. Otherwise they stink over time! Caterpillars, worms, and other "creepy crawlies"--A bug jar is good for catch and release. Observe for a short time and then let them go again. Fireflies or lightening bugs are always a hit! Leaves--So many different shapes! We love finding heart shaped ones and have also made collections of leaves. Are there cautions to collecting "natural treasures"? Be respectful of where natural treasures are collected. Some treasures should just be observed. Try sketching or snapping a picture of some treasures that shouldn't be kept or carried around. Some areas, like our backyard are fine to collect. Other places, like a botanic garden, are just to observe. It's okay to have different norms for different places. Teach children what your expectations are. As far as the dead bird is, I guess I never taught my children not to touch dead animals. While it was a great find, it is one to "observe" and/or use gloves with if we wanted to do a short term study. Know laws that might prohibit. Most bird feathers and nests are protected by law. This article explains it more and gives good advice on how to let the feathers stay on the ground. Live animals or plants might need special consideration. Decide what your policy is and investigate the policy of where you are collecting, i.e. don't collect at a nature preserve. Ask property owners if it's okay to collect plants. Use sanitary precautions as needed. What to do with "natural treasures"? Take a picture or draw a sketch in a nature journal to record it. Then the treasure can be left for others to enjoy. Make a collection of special treasures. 4-H encourages and gives helps for some collections, such as leaves, rocks, or insects. They can be displayed in cases, clear peanut butter jars, egg cartons, or other containers. Have a special shelf in the house or on the porch for treasures. As it gets filled up, choices need to be made as to what should return to nature. Use natural treasures for art projects. Seeds make wonderful additions to nature collages. In the case of live animals, we just observe and then return to the place we found them. Make a special box for each child to keep very special treasures. Use the items as part of your Loose Parts Play collection. These can be used in so many ways! The topic of "stuff" in pockets often comes up. How do you manage all these pockets of "natural treasures"? I've seen pictures of families with a basket at the front door to empty pockets before children come in. Have a basket in the bathroom and have pocket emptying part of the process of changing clothes. Why should we allow children to find "natural treasures"? This is self directed learning often. They choose what is interesting and important to them. Note: This is what I found this young guy doing with his wing--blowing it around on the ground! It fluttered and floated and gently landed on the ground again, only to start right over! 10 Reasons to go Apple Picking!